Cookistry: Sous Vide Shrimp - Perfectly Cooked for Shrimp Cocktail! Plus a Super-Quick Sauce! Sous Vide Shrimp - Perfectly Cooked for Shrimp Cocktail! Plus a Super-Quick Sauce! Oh, look, another sous vide post. Don't worry. It's not going to be all sous vide all the time. 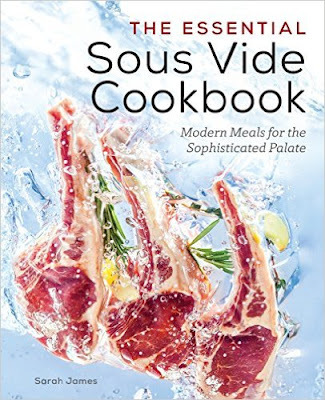 But I'm working my way through sous vide cookbooks, looking for the one that will be my go-to book. This time, the book is The Essential Sous Vide Cookbook by Sarah James. I bought this one because the author had a pretty good track record working for Instructables. Raw, shell-on shrimp were on sale at my local grocery store, so I bought 2 pounds, then I decided to see if the book had any sous vide recipes. Yup. There was a very simple recipe, which was exactly what I was looking for. With sous vide recipes, my first concern is whether the cooking time and temperature will work. If that doesn't work, the rest of the recipe doesn't matter. Shrimp is a good candidate for sous vide cooking since shrimp go from undercooked to overcooked in the blink of an eye. Overcooked shrimp are the most likely result because if you cook them until they're done, the carryover heat takes care of the overcooking. And then they're kind of tough and rubbery. The instructions were simply. Put the cleaned peeled shrimp into a sous vide bag with a little bit of olive oil or butter so they'll fit in a single layer. I used butter. Then, cook at 130 degrees for 15 minutes, drop the bag into cold water to begin the cooling process, then refrigerate. 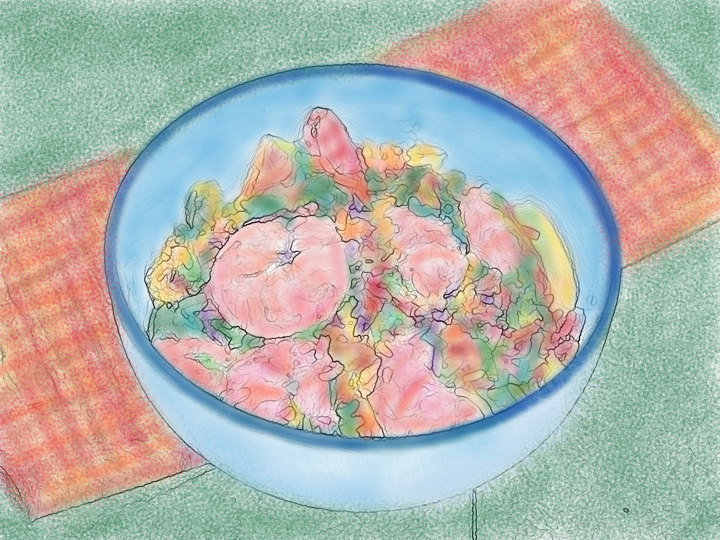 Then the shrimp can be used in salads, with cocktail sauce, or however you want to serve them. The interesting thing was that two recipes where the shrimp was served hot used a temperature of 135 degrees for 30 minutes, with no interim chilling. But for chilled shrimp, I'm going to say this time and temperature was really nice. I also tossed some into hot leftover fried rice, and the were perfect for that, too. Heat the water to 130 degrees. Place the shrimp and butter into a sous vide bag so they'll fit in a single layer. Put the bag into the sous vide water and cook for 15 minutes. Remove the bag from the water and place it in cold water to start the chilling process, then refrigerate until fully chilled. Serve cold in salad, with cocktail sauce, or however you like. I even stirred them into some leftover vegetable stir-fried rice that I had left over. So yum! This is pretty much the only cocktail sauce I ever had when I was a kid. We always used a brand-name chili sauce to make the sauce, but the folks at Kam's Kettle Cooked sent me some of their mild-flavored sauce as a sample(they make both mild and hot), so I used that instead. Their sauce has a slightly spicier flavor which worked perfectly well for my cocktail sauce. To make the cocktail sauce, just mix chili sauce with jarred horseradish - whatever proportion you like. As horseradish sits around, it loses strength, so if you have a fresh jar, you might just need a tiny bit. If the jar has been hanging around a while, it will take more to get the same kick. If the jar has been around for a long time, it might have no life left, so it's time to buy a new jar. If you make too much cocktail sauce for the amount of shrimp you have, mix it with some mayonnaise and a little bit of chopped sweet pickle or sweet pickle relish to make Thousand Island salad dressing. About the cookbook: I've only made this one recipe from this book, so I can't really draw an opinion yet. I'll be making more recipes soon. The book was NOT free from the publisher. I bought this one. For more blog posts coloring pages, click here or click the Coloring Book Pages tab at the top.